What are the causes of the flu (influenza)? When does flu season begin and end? What are flu (influenza) symptoms in adults and in children? How long is the flu contagious, and how long does the flu last? How do health care professionals diagnose the flu (influenza)? What is the key to flu (influenza) prevention? Are there any nasal spray vaccine or flu shot side effects in adults or in children? Why should the flu (influenza) vaccine be taken every year? What are some flu treatments an individual can do at home (home remedies)? What types of doctors treat the flu? What medications treat the flu? What can people eat when they have the flu? When should a person go to the emergency department for the flu? Who should receive the flu vaccine, and who has the highest risk factors? When should someone get the flu shot? What is the prognosis for patients who get the flu? What are possible complications of the flu? Can the flu be deadly? What is the bird (avian) flu? Do antiviral agents protect people from the flu? Is it safe to get a flu shot that contains thimerosal? Where can people find additional information about the flu? Influenza, commonly called "the flu," is caused by viruses that infect the respiratory tract. The incubation period for flu is about one to four days. Flu is contagious, and symptoms may last up to seven to 14 days. Flu is diagnosed by the patient's history, physical exam, and laboratory tests. Flu is spread directly and indirectly; directly from person to person by airborne droplets produced during sneezing or coughing, for example, and indirectly when contaminated droplets land on surfaces that are subsequently touched by uninfected individuals. Influenza viruses are divided into three types, designated A, B, and C, with influenza A types usually causing the most problems in humans. Most people who get the conventional or seasonal flu recover completely in one to two weeks, but some people develop serious and potentially life-threatening medical complications, such as pneumonia. Much of the illness and death caused by conventional or seasonal influenza can be prevented by annual influenza vaccination. Influenza A undergoes frequent antigenic changes that require new vaccines to be developed and people to obtain a new vaccination every year. New vaccine technology is being developed. In April 2009, a new flu virus termed novel H1N1 swine flu developed in Mexico, rapidly spread worldwide, and caused the WHO to declare a flu pandemic. Eventually, the WHO declared the pandemic over in 2010. In 2012, a new type of flu strain developed, H3N2v, but has not developed into any epidemic situations currently. Effectiveness of the flu vaccine varies year to year because strains causing flu also vary yearly. Some home remedies may reduce flu symptoms. Suggestions for foods are listed to help individuals recover from the flu. Prescribed medicine for flu virus and over-the-counter treatments for the flu are listed. Like the influenza virus, drug treatments are constantly changing and improving, but currently, timely vaccination is still considered to be the best defense against the flu. However, the U.S. Centers for Disease Control and Prevention (CDC) considers antiviral drugs an important adjunct to the flu vaccine in the control of the disease process. CDC recommendations for use in treatment of the flu for the 2018-2019 flu season are listed. People should be aware that flu pandemics can cause severe flu symptoms and sometimes cause death in many individuals who may be more susceptible to the pandemic flu than the conventional flu; however, the previous pandemic flu virus (H1N1) has been available in vaccines and is considered part of the conventional circulating flu viruses. Bird flu (H5N1) mainly infects birds, but it also infects humans who have close contacts with birds. Individuals should check with their doctors to determine if they are considered to be at higher risk of getting severe flu symptoms than the normally healthy population. Influenza, commonly called "the flu," is an illness caused by RNA viruses that infect the respiratory tract of many animals, birds, and humans. In most people, the infection results in the person getting a fever, cough, headache, and malaise (tired, no energy); some people also may develop a sore throat, nausea, vomiting, and diarrhea. The majority of individuals has flu symptoms for about one to two weeks and then recovers with no problems. However, compared with most other viral respiratory infections, such as the common cold, influenza (flu) infection can cause a more severe illness with a mortality rate (death rate) of about 0.1% of people who are infected with the virus. The above is the usual situation for the yearly occurring "conventional" or "seasonal" flu strains. However, there are situations in which some flu outbreaks are severe. These severe outbreaks occur when a portion of the human population is exposed to a flu strain against which the population has little or no immunity because the virus has become altered in a significant way. These outbreaks are usually termed epidemics. Unusually severe worldwide outbreaks (pandemics) have occurred several times in the last hundred years since influenza virus was identified in 1933. By an examination of preserved tissue, the worst influenza pandemic (also termed the Spanish flu or Spanish influenza) occurred in 1918 when the virus caused between 40-100 million deaths worldwide, with a mortality rate estimated to range from 2%-20%. In April 2009, a new influenza strain against which the world population has little or no immunity was isolated from humans in Mexico. It quickly spread throughout the world so fast that the WHO declared this new flu strain (first termed novel H1N1 influenza A swine flu, often later shortened to H1N1 or swine flu) as the cause of a pandemic on June 11, 2009. This was the first declared flu pandemic in 41 years. Fortunately, there was a worldwide response that included vaccine production, good hygiene practices (especially hand washing) were emphasized, and the virus (H1N1) caused far less morbidity and mortality than was expected and predicted. The WHO declared the pandemic's end on Aug. 10, 2010, because it no longer fit into the WHO's criteria for a pandemic. A new influenza strain, H3N2, was identified in 2011, but this strain has caused only about 330 infections with one death in the U.S. Another strain, H5N1, a bird flu virus, has been identified since 2003 and has caused about 650 human infections; this virus has not been detected in the U.S. and currently is to be easily spread among people in contrast to other flu strains. Unfortunately, people infected with H5N1 have a high death rate (about 60% of infected people die); currently, H5N1 is not readily transferred from person to person like other flu viruses. The most recent data for the mortality (death rates) from influenza rate (death rate) for the United States in 2016 indicates that mortality from influenza varies from year to year. Death rates estimated by the CDC range from about 12,000 during 2011-2012 to 56,000 during 2012-2013. In the 2017-2018 season, deaths reached a new high of about 79,000. Experts suggest that a large percentage of people went unvaccinated or refused to vaccinate family members, causing the increased the number of deaths due to the flu. Haemophilus influenzae is a bacterium that was incorrectly considered to cause the flu until the virus was demonstrated to be the correct cause in 1933. This bacterium can cause lung infections in infants and children, and it occasionally causes ear, eye, sinus, joint, and a few other infections, but it does not cause the flu. Another confusing term is stomach flu. This term refers to a gastrointestinal tract infection, not a respiratory infection like influenza (flu); stomach flu (gastroenteritis) is not caused by influenza viruses. Although initially symptoms of influenza may mimic those of a cold, influenza is more debilitating with symptoms of fatigue, fever, and respiratory congestion. Colds can be caused by over 100 different virus types, but only influenza viruses (and subtypes) A, B, and C cause the flu. In addition, colds do not lead to life-threatening illnesses like pneumonia, but severe infections with influenza viruses can lead to pneumonia or even death. Compared with most other viral respiratory infections, such as the common cold, influenza (flu) infection usually causes a more severe illness with a mortality rate (death rate) of about 0.1% of people who are infected with the virus. Cold symptoms (for example, sore throat, runny nose, cough (with possible phlegm production), congestion, and slight fever) are similar to flu symptoms, but the flu symptoms are more severe, last longer, and may include vomiting, diarrhea, and cough that is often a dry cough. Although some of the symptoms of influenza may mimic those of food poisoning, others do not. Most symptoms of food poisoning include nausea, vomiting, watery diarrhea, abdominal pain, cramps, and fever. Note that the majority of food poisoning symptoms are related to the gastrointestinal tract, except for fever. The common flu signs and symptoms include fever but also include symptoms that are not typical for food poisoning, because the flu is a respiratory disease. Consequently, respiratory symptoms of nasal congestion, dry cough, and some breathing problems help distinguish the flu from food poisoning. Influenza viruses cause the flu and are divided into three types, designated A, B, and C. Influenza A and influenza B are responsible for epidemics of respiratory illness that occur almost every winter and are often associated with increased rates of hospitalization and death. Influenza type C differs from types A and B in some important ways. Type C infection usually causes either a very mild respiratory illness or no symptoms at all; it does not cause epidemics and does not have the severe public-health impact of influenza types A and B. Efforts to control the impact of influenza are aimed at types A and B, and the remainder of this discussion will be devoted only to these two types. Type A viruses are divided into subtypes or strains based on differences in two viral surface proteins called the hemagglutinin (H) and the neuraminidase (N). There are at least 16 known H subtypes and nine known N subtypes. These surface proteins can occur in many combinations. When spread by droplets or direct contact, the virus, if not killed by the host's immune system, replicates in the respiratory tract and damages host cells. In people who are immune compromised (for example, pregnant women, infants, cancer patients, asthma patients, people with pulmonary disease, and many others), the virus can cause viral pneumonia or stress the individual's system to make them more susceptible to bacterial infections, especially bacterial pneumonia. Both pneumonia types, viral and bacterial, can cause severe disease and sometimes death. Influenza type A viruses undergo two major kinds of changes. One is a series of mutations that occurs over time and causes a gradual evolution of the virus. This is called antigenic "drift." The other kind of change is an abrupt change in the hemagglutinin and/or the neuraminidase proteins. This is called antigenic "shift." In this case, a new subtype of the virus suddenly emerges. Type A viruses undergo both kinds of changes; influenza type B viruses change only by the more gradual process of antigenic drift and therefore do not cause pandemics. The 2009 pandemic-causing H1N1 virus was a classic example of antigenic shift. Research showed that novel H1N1 swine flu has an RNA genome that contains five RNA strands derived from various swine flu strains, two RNA strands from bird flu (also termed avian flu) strains, and only one RNA strand from human flu strains. According to the CDC, mainly antigenic shifts over about 20 years led to the development of novel H1N1 flu virus. 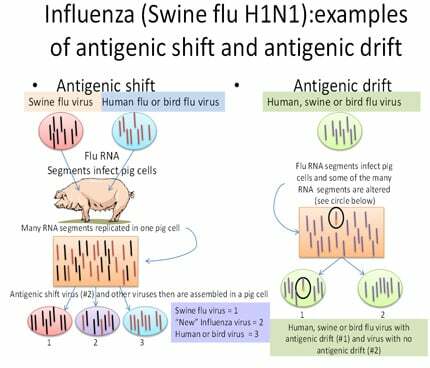 A diagram that illustrates both antigenic shift and drift can be found below (see Figure 2) and features influenza A types H1N1 and bird flu (H5N1), but almost every influenza A viral strain can go through these processes that changes the viral RNA. A recent flu epidemic in India was partially blamed on antigenic drift/shift. Flu season officially begins in October of each year and extends to May of the following year. According to the CDC, people can follow the development of flu across the United States by following CDC's weekly update of the locations where flu is developing in the U.S. (see the flu map). Although appetite loss, nausea, vomiting, and diarrhea can sometimes accompany influenza infection, especially in children, gastrointestinal symptoms are rarely prominent. The term "stomach flu" is a misnomer that is sometimes used to describe gastrointestinal illnesses caused by other microorganisms. H1N1 infections, however, caused more nausea, vomiting, and diarrhea than the conventional (seasonal) flu viruses. Depending upon the severity of the infection, some patients can develop swollen lymph nodes, muscle pain, shortness of breath, severe headaches, chest pain or chest discomfort, dehydration, and even death. Most individuals who contract influenza recover in a week or two, however, others develop potentially life-threatening complications like pneumonia. In an average year, influenza is associated with about 36,000 deaths nationwide and many more hospitalizations. Flu-related complications can occur at any age; however, the elderly and people with chronic health problems are much more likely to develop serious complications after the conventional influenza infections than are younger, healthier people. When people ignore or refuse vaccination, the death rate increases as shown by the recent higher death rates. As mentioned previously, has hemagglutinin on the viral surface. The viral hemagglutinins have at least 18 types, but these types are broken into two main influenza A categories. For example, one of the two main categories include human H1, H2, and avian H5 viruses while the other major category includes human H3 and avian H7 viruses. Researchers in 2016 at UCLA and the University of Arizona discovered that if you were exposed to one of these groups as a child, you had a much better chance of being protected against other viruses in that same group or category later in life. For example, if you are exposed to H2 as a child and then later in life to H2 or H5 viruses, you may have as high as a 75% chance of protection against those H2 and/or H5 strains, but if you are exposed to the other major category that included H3 or H7, you would be much more susceptible to these viral types. The reverse situation would be true if you were exposed as a child to H3 or H7 viruses. The researchers concluded that the immunological imprinting early in life helps determine the response (immune response) to these viral types or categories. Consequently, the first strain of flu that a person is exposed to in childhood likely determines that person's risk in the future for severity of the flu depending upon the exact category of the first viral strain that infects the child. The researchers hope to exploit these new findings in the development of new and more effective flu vaccines. Incubation period for the flu, which means the time from exposure to the flu virus until initial symptoms develop, typically is one to four days with an average incubation period of two days. The flu is typically contagious about 24-48 hours before symptoms appear (from about the last day of the incubation period) and in normal healthy adults is contagious for another five to seven days. Children are usually contagious for a little while longer (about seven to 10 days). Individuals with severe infections may be contagious as long as symptoms last (about seven to 14 days). In adults, flu symptoms usually last about five to seven days, but in children, the symptoms may last longer (about seven to 10 days). However, some symptoms such as weakness and fatigue may gradually wane over several weeks. The flu is presumptively diagnosed clinically by the patient's history of association with people known to have the disease and their symptoms listed above. Usually, a quick test (for example, nasopharyngeal swab sample) is done to see if the patient is infected with influenza A or B virus. Most of the tests can distinguish between A and B types. The test can be negative (no flu infection) or positive for types A or B. If it is positive for type A, the person could have a conventional flu strain or a potentially more aggressive strain such as H1N1. Most of the rapid tests are based on PCR technology that identifies the genetic material of the virus. Some rapid influenza diagnostic tests (RIDTs) can screen for influenza in about 10-30 minutes. Swine flu (H1N1) and other influenza strains like bird flu or H3N2 are definitively diagnosed by identifying the particular surface proteins or genetic material associated with the virus strain. In general, this testing is done in a specialized laboratory. However, doctors' offices are able to send specimens to specialized laboratories if necessary. How can you get influenza? Flu is easily spread from person to person both directly and indirectly. The influenza virus can spread to other people in droplets contaminated with the virus. Produced by coughing, sneezing, or even talking, these droplets land near or in the mouth or the nose of uninfected people, and the disease may spread to them. The disease can spread indirectly to others if contaminated droplets land on utensils, dishes, clothing, or almost any surface and then are touched by uninfected people. If the infected person touches their nose or mouth, for example, they transfer or spread the disease to themselves or others. Most of the illness and death caused by influenza can be prevented by annual influenza vaccination. The CDC's current Advisory Committee on Immunization Practices (ACIP) issued recommendations for everyone 6 months of age and older, who do not have any contraindications to vaccination, to receive a flu vaccine each year. Flu vaccine (influenza vaccine made from inactivated and sometimes attenuated [noninfective] virus or virus components) is specifically recommended for those who are at high risk for developing serious complications as a result of influenza infection. The FDA approved a new vaccine type, Fluzone Intradermal, in 2011 (for adults 18-64 years of age). This injection goes only into the intradermal area of the skin, not into the muscle (IM) like most conventional flu shots, and uses a much smaller needle than the conventional shots. This killed viral preparation is supposed to be about as effective as the IM shot but claims to produce less pain and fewer side effects (see section below). However, it is not available for the 2018-2019 flu season. Other simple hygiene methods can reduce or prevent some individuals from getting the flu. For example, avoiding kissing, handshakes, and sharing drinks or food with infected people and avoiding touching surfaces like sinks and other items handled by individuals with the flu are good preventive measures. Washing one's hands with soap and water or by using an alcohol-based hand sanitizer frequently during the day may help prevent the infection. Individuals with the flu should avoid coughing or sneezing on uninfected people; quick hugs are probably okay as long as there is no contact with mucosal surfaces and/or droplets that may contain the virus. Although annual influenza (injectable) vaccination has long been recommended for people in the high-risk groups, many still do not receive the vaccine, often because of their concern about side effects. They mistakenly perceive influenza as merely a nuisance and believe that the vaccine causes unpleasant side effects or that it may even cause the flu. The truth is that influenza vaccine causes no side effects in most people. In the past, patients with egg allergy had restrictions on getting the vaccine. However, extensive research has indicated that there is not enough egg protein in the vaccine to trigger an immune response, and all the recommendations about allergies to eggs has been dropped for the 2018-2019 flu season by several organizations that regulate vaccines. Also, the vaccine is not recommended while individuals have active infections or active diseases of the nervous system. Less than one-third of those who receive the vaccine have some soreness at the vaccination site, and about 5%-10% experience mild side effects, such as headache, low-grade fever, or muscle cramps, for about a day after vaccination; some may develop swollen lymph nodes. These side effects are most likely to occur in children who have not been exposed to the influenza virus in the past. The intradermal shots reportedly have similar side effects as the IM shot but are less intense and may not last as long as the IM shot. Nevertheless, some older people remember earlier influenza vaccines that did, in fact, produce more unpleasant side effects. Vaccines produced from the 1940s to the mid-1960s were not as highly purified as modern influenza vaccines, and it was these impurities that caused most of the side effects. Since the side effects associated with these early vaccines, such as fever, headache, muscle aches, and/or fatigue and malaise, were similar to some of the symptoms of influenza, people believed that the vaccine had caused them to get the flu. However, injectable influenza vaccine produced in the United States has never been capable of causing influenza because it consists of killed virus. Another type of influenza vaccine (nasal spray) is made with live attenuated (altered) influenza viruses (LAIV) but is not currently recommended by the CDC. This vaccine is made with live viruses that can stimulate the immune response enough to confer immunity but do not cause classic influenza symptoms (in most instances). The nasal spray vaccine (FluMist) was only approved for healthy individuals ages 2-49 years of age and was recommended preferentially for healthy children aged 2 through 8 who did not have contraindications to receiving the vaccine, if it is readily available. This nasal spray vaccine contains live attenuated virus (less able to cause flu symptoms due to a designed inability to replicate at normal body temperatures). This live vaccine could possibly cause the disease in infants and immunocompromised people and does not produce a strong immune response in many older people. Side effects of the nasal spray vaccine include nasal congestion, sore throat, and fever. Headaches, muscle aches, irritability, and malaise have also been noted. In most instances, if side effects occur, they only last a day or two. This nasal spray has been produced for conventional flu viruses and should not be given to pregnant women or anyone who has a medical condition that may compromise the immune system because in some instances the flu may be a side effect. Some people do not receive influenza vaccine because they believe it is not very effective. There are several different reasons for this belief. People who have received influenza vaccine may subsequently have an illness that is mistaken for influenza, and they believe that the vaccine failed to protect them. In other cases, people who have received the vaccine may indeed have an influenza infection. Overall vaccine effectiveness varies from year to year, depending upon the degree of similarity between the influenza virus strains included in the vaccine and the strain or strains that circulate during the influenza season. Because the vaccine strains must be chosen nine to 10 months before the influenza season, and because influenza viruses mutate over time, sometimes mutations occur in the circulating virus strains between the time the vaccine strains are chosen and the next influenza season ends. These mutations sometimes reduce the ability of the vaccine-induced antibody to inhibit the newly mutated virus, thereby reducing vaccine effectiveness. This commonly occurs with the conventional flu vaccines as the specific virus types chosen for vaccine inclusion are based on reasoned projections for the upcoming flu season. Occasionally, the vaccine does not match the actual predominating virus strain and is not very effective in generating a specific immune response to the predominant infecting flu strain. Vaccine efficacy also varies from one person to another. Past studies of healthy young adults have shown influenza vaccine to be 70%-90% effective in preventing illness. In the elderly and those with certain chronic medical conditions such as HIV, the vaccine is often less effective in preventing illness. Studies show the vaccine reduces hospitalization by about 70% and death by about 85% among the elderly who are not in nursing homes. Among nursing-home residents, vaccine can reduce the risk of hospitalization by about 50%, the risk of pneumonia by about 60%, and the risk of death by 75%-80%. However, these figures did not apply to the 2014-2015 flu vaccine because the quadrivalent (four antigenic types) vaccine did not match well with 2014-2015 circulating strains of the flu (vaccine effectiveness was estimated to be 23%). This occurs because the vaccine needs to be produced months before the flu season begins, so the vaccine is designed by projecting and choosing the most likely viral strains to include in the vaccine. If drift results in changing the circulating virus from the strains used in the vaccine, efficacy may be reduced. However, the vaccine is still likely to lessen the severity of the illness and to prevent complications and death, according to the CDC. Although only a few different influenza virus strains circulate at any given time, people may continue to become ill with the flu throughout their lives. The reason for this continuing susceptibility is that influenza viruses are continually mutating, through the mechanisms of antigenic shift and drift described above. Each year, the vaccine is updated to include the most current influenza virus strains that are infecting people worldwide. The fact that influenza viral genes continually change is one of the reasons vaccine must be taken every year. Another reason is that antibody produced by the host in response to the vaccine declines over time, and antibody levels are often low one year after vaccination so even if the same vaccine is used, it can act as a booster shot to raise immunity. Many people still refuse to get flu shots because of misunderstandings, fear, "because I never get any shots," or simply a belief that if they get the flu, they will do well. These are only some of the reasons -- there are many more. The U.S. and other countries' populations need to be better educated about vaccines; at least they should realize that safe vaccines have been around for many years (measles, mumps, chickenpox, and even a vaccine for cholera), and as adults they often have to get a vaccine-like shot to test for tuberculosis exposure or to protect themselves from tetanus. The flu vaccines are as safe as these vaccines and shots that are widely accepted by the public. Consequently, better efforts need to be made to make yearly flu vaccines as widely acceptable as other vaccines. Susceptible people need to understand that the vaccines afford them a significant chance to reduce or prevent this potentially debilitating disease, hospitalization and, in a few, a lethal flu-caused disease. First, individuals should be sure they are not members of a high-risk group that is more susceptible to getting severe flu symptoms. Check with a physician if you are unsure if you are a higher-risk person. Home care is recommended by the CDC if a person is healthy with no underlying diseases or conditions (for example, asthma, lung disease, pregnant, or immunosuppressed). Increasing liquid intake, warm showers, and warm compresses, especially in the nasal area, can reduce the body aches and reduce nasal congestion or head congestion. Nasal strips and humidifiers may help reduce congestion, especially while trying to sleep. Some physicians recommend nasal irrigation with saline to further reduce congestion; some recommend nonprescription decongestants like pseudoephedrine (Sudafed). Fever can be treated with over-the-counter acetaminophen (Tylenol) or ibuprofen (Advil, Motrin and others); read labels for safe dosage. Cough can be suppressed by cough drops, over-the-counter cough syrup, or cough medicine that may contain dextromethorphan (Delsym) and/or guaifenesin (Mucinex). Notify a doctor if an individual's symptoms at home get worse. Individuals with mild flu symptoms may not require the care of a physician unless they are a member of a high-risk group as described above. For many individuals, treatment is provided by their primary care physician or provider (including internists or family medicine specialists and physician assistants and other primary caregivers) or pediatrician. Complicated or severe flu infections may require consultation with an emergency-medicine physician, critical care specialist, infectious-disease specialist, and/or a lung specialist (pulmonologist). Antiviral medications with activity against influenza viruses are an important adjunct to influenza vaccine in the control of influenza. 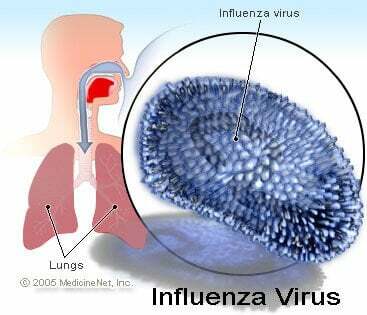 Influenza antiviral prescription drugs can be used to treat influenza or to prevent influenza. Oseltamivir, zanamivir, and peramivir are chemically related antiviral medications known as neuraminidase inhibitors that have activity against both influenza A and B viruses. In October 2018 (10/24/2018), the FDA approved a new antiviral drug (baloxavir marboxil [Xofluza]) for flu treatment that prevents viral replication. The following are the CDC-recommended antiviral medications for the treatment of influenza (flu) for the 2018-2019 season are as follows: oral oseltamivir (Tamiflu), inhaled zanamivir (Relenza), and intravenous peramivir (Rapivab). See Table 1 below for details about utilizing these drugs in adults and children. Please note that the CDC has not revised the Table 1 data to include the new drug, Xofluza. The following are the CDC recommended antiviral medications for the treatment of influenza (flu) for the 2016-2017 season are as follows: oral oseltamivir (Tamiflu), inhaled zanamivir (Relenza), and intravenous peramivir (Rapivab). See Table 1 below for details about utilizing these drugs in adults and children. Over-the-counter medications that may help reduce symptoms of congestion (decongestants), coughing (cough medicine), and dehydration include diphenhydramine (Benadryl), acetaminophen (Tylenol), NSAIDs (Advil, Motrin, Aleve), guaifenesin (Mucinex), dextromethorphan (Delsym), pseudoephedrine (Sudafed), and oral fluids. Aspirin may be used in adults but not in children. Antibiotics treat bacterial infections, not viral illnesses like the flu. Individuals with the flu may also benefit from some additional bed rest, throat lozenges, and possibly nasal irrigation; drinking fluids may help prevent symptoms of dehydration (for example, dry mucus membranes and decreased urination). While a person has the flu, good nutrition can help the recovery process. Anyone with the flu needs to avoid dehydration, soothe sore throat and/or upset stomach, and have a good protein intake. Dehydration can be avoided by adequate fluid intake such as juices (orange, cranberry, grapefruit, tomato, grape, and others). Sore throat and upset stomach may be relieved by broths or warm soups (chicken, vegetable, or beef) and plain crackers, toast, and ginger tea or noncarbonated ginger ale. Scrambled eggs, yogurt, and/or protein drinks are good protein sources. In addition, bananas, rice, and applesauce are food that are often recommended for those with an upset stomach. This list is not exhaustive but should provide a balanced approach to help speed recovery from the flu. Having a high fever for more than three days is another danger sign, according to the WHO, so the CDC has also included this as another serious symptom. In the United States, the flu season usually occurs from about November until April. Officials have decided each new flu season will start each year on Oct. 4. Typically, activity is very low until December, and peak activity most often occurs between January and March. Ideally, the conventional flu vaccine should be administered between September and mid-November. Flu season typically occurs between October and May. It takes about one to two weeks after vaccination for antibodies against influenza to develop and provide protection. The CDC has published a summary list of their current recommendations of who should get the current vaccine. Vaccine viruses included in the 2018-19 U.S. trivalent influenza vaccines will be an A/Michigan/45/2015 (H1N1) pdm09-like virus, an A/Singapore/INFIMH-16-0019/2016 (H3N2)-like virus, and a B/Colorado/06/2017-like virus (Victoria lineage). Quadrivalent influenza vaccines will contain these three viruses and an additional influenza B vaccine virus, a B/Phuket/3073/2013-like virus (Yamagata lineage). Following two seasons (2016-17 and 2017-18) during which the ACIP recommended that LAIV4 not be used, the ACIP voted in February 2018 to recommend that for the 2018-19 season, vaccination providers may choose to administer any licensed, age-appropriate influenza vaccine (IIV, RIV4, or LAIV4). LAIV4 is an option for those for whom it is appropriate (Table 2). People with a history of egg allergy of any severity may receive any licensed, recommended, and age-appropriate influenza vaccine (IIV, RIV4, or LAIV4). IIV and RIV4 have been previously recommended. Use of LAIV4 for people with egg allergy was approved by ACIP in February 2016. Additional recommendations concerning vaccination of egg-allergic people are discussed. Two recent regulatory actions are described. In August 2017, the FDA approved an expanded age indication for Afluria Quadrivalent (IIV4). Previously licensed for people ≥18 years of age, Afluria Quadrivalent is now licensed for people ≥5 years of age. In January 2018, the FDA approved an expanded age indication for Fluarix Quadrivalent (IIV4). Previously licensed for people ≥3 years of age, Fluarix Quadrivalent is now licensed for people ≥6 months of age. Children 6 through 35 months of age may receive Fluarix Quadrivalent at the same 0.5 mL per dose (containing 15 µg of hemagglutinin [HA] per vaccine virus) as is used for older children and adults. This licensure creates a third option for inactivated influenza vaccines for children aged 6 through 35 months, in addition to the previously available 0.5 mL per dose (containing 15 µg of HA per vaccine virus) presentation of FluLaval Quadrivalent (IIV4) and 0.25 mL per dose presentation (containing 7.5 µg of HA per vaccine virus) of Fluzone Quadrivalent (IIV4). A high-dose vaccine (Fluzone High-Dose) that contains four times the regular dose of antigen in a regular flu shot is generally recommended for seniors 65 and older to get a better immune response. For more information and details too extensive to include here, the following site is recommended: http://www.cdc.gov/flu/professionals/acip/index.htm. In general, the majority (about 90%-95%) of people who get the disease feel terrible (see symptoms) but recover with no problems. People with suppressed immune systems historically have worse outcomes than uncompromised individuals; current data suggest that pregnant individuals, children under 2 years of age, young adults, and individuals with any immune compromise or debilitation are likely to have a worse prognosis. Complications from the flu may worsen medical conditions such as asthma, congestive heart failure, and diabetes. Other complications may include ear infections, sinus infections, dehydration, pneumonia, and even death. In most outbreaks, epidemics, and pandemics, the mortality rates are highest in the older population (usually above 50 years old). Complications of any flu virus infection, although relatively rare, may resemble severe viral pneumonia or the SARS (severe acute respiratory syndrome caused by a coronavirus strain) outbreak in 2002-2003, in which the disease spread to about 10 countries with over 7,000 cases, over 700 deaths, and had a 10% mortality rate. Guillain-Barré syndrome (GBS), a rare immune disorder that can result in weakness or paralysis, may occur after having the flu or very rarely, after vaccination against the flu (estimated by the CDC to be about one person per every million people vaccinated). Yes. However, associated deaths per year depend upon the virulence of the particular strain of virus that is circulating. That means for any given year, the likelihood of dying from the flu varies according to the specific infecting viruses. For example, from 1976-2007 (the most reliable available data according to the CDC), deaths associated with the flu range from a low of about 3,000 per year to a high of about 49,000 per year. The CDC estimates about 36,000 deaths/year in the U.S. in recent years, but these may increase if vaccination rates continue to fall. The 1918 flu pandemic (1918-1919) was estimated to cause 20-50 million deaths worldwide. The bird flu, also known as avian influenza and H5N1, is an infection caused by avian influenza A. Bird flu can infect many bird species, including domesticated birds such as chickens. In most cases, the disease is mild; however, some subtypes can be pathogenic and rapidly kill birds within 48 hours. Rarely, humans can be infected by these bird viruses. People who get infected with bird flu usually have direct contact with the infected birds or their waste products. Depending on the viral type, the infections can range from mild influenza to severe respiratory problems or death. Human infection with bird flu is rare but frequently fatal. More than half of those people infected (over 650 infected people) have died (current estimates of the mortality [death] rates in humans is about 60%). Fortunately, this virus does not seem to be easily passed from person to person. The major concern among scientists and physicians about bird flu is that it will change (mutate) its viral RNA enough to be easily transferred among people and produce a pandemic similar to the one of 1918. There have been several isolated instances where a person had been reported to get avian flu in 2010; the virus was detected in South Korea (three human cases), resulting in a quarantine of two farms, and in 2012, over 10,000 turkeys died in a H5N1 outbreak with no human infections recorded. Recent research suggests that some people may have had exposure to H5N1 in their past but had either mild or no symptoms. In addition, researchers, in an effort to understand what makes an animal or bird flu become easily transmissible to humans, developed a bird flu strain that is likely easily transmitted from person to person. Although it exists only in research labs, there is controversy about both the synthesis and the scientific publication of how this potentially highly pathogenic strain was created. Vaccination is the primary method for control of influenza; however, antiviral agents have a role in the prevention and treatment of mainly influenza type A infection. Regardless, antiviral agents should not be considered as a substitute or alternative for vaccination. Most effectiveness of these drugs is reported to occur if the antivirals are given within the first 48 hours after infection; some researchers maintain there is little or no solid evidence these drugs can protect people from getting the flu so some controversies exist regarding these agents. "Is it safe for children to receive an influenza vaccine that contains thimerosal?" "Yes. There is no convincing evidence of harm caused by the small doses of thimerosal preservative in influenza vaccines, except for minor effects like swelling and redness at the injection site." "Is it safe for pregnant women to receive an influenza vaccine?" "Yes. A study of influenza vaccination examining over 2,000 pregnant women demonstrated no adverse fetal effects associated with influenza vaccine. Case reports and limited studies indicate that pregnancy can increase the risk for serious medical complications of influenza. One study found that out of every 10,000 women in their third trimester of pregnancy during an average flu season, 25 will be hospitalized for flu-related complications." However, as stated above, the FDA goes on to say that single-dose vial of conventional and other flu vaccines will not contain the preservative thimerosal, so that if a person wants to avoid the thimerosal, they can ask for vaccine that comes in a single-dose vial. The nasal spray vaccine contains no thimerosal, but it is not recommended for use in pregnant women. The CDC further states, that after numerous studies, there is no established link between flu shots with or without thimerosal and autism. During a flu pandemic, guidelines and situations can change rapidly. People are advised to be aware that several sources are available to them to keep current with developments. The web sites below are frequently updated, especially when a pandemic is declared. The first web site contains an update written for the public and caregivers; the government and WHO sites provide detailed information that are updated as guidelines and developments occur. Grohskopf, L.A., L.Z. Sokolow, K.R. Broder, et al. "Prevention and Control of Seasonal Influenza with Vaccines: Recommendations of the Advisory Committee on Immunization Practices -- United States, 2018-19 Influenza Season." MMWR 67.3 Aug. 24, 2018: 1-20. Lambert, L., and Fauci, A. "Influenza Vaccines for the Future." New Eng. J. Med. 361.21 (2010): 2036-2044. Monto, A.S., Ohmit, S.E., Petrie, J.G., Johnson, E., Truscon, R., Teich, E., Rotthoff, J., Boulton, M., Victor, J.C. "Comparative Efficacy of Inactivated and Live Attenuated Influenza Vaccines." N Engl J Med 361 Sept. 24, 2009: 1260. Nguyen, H. "Influenza." Medscape.com. Aug. 22, 2016. <http://emedicine.medscape.com/article/219557-overview>. Perez-Padilla, R., de la Rosa-Zamboni, D., Ponce de Leon, S.P., Hernandez, M., Quinones-Falconi, F., Bautista, E., Ramirez-Venegas, A., Rojas-Serrano, J., Ormsby, C.E., Corrales, A., Higuera, A., Mondragon, E., Cordova-Villalobos, J.A. "Pneumonia and Respiratory Failure from Swine-Origin Influenza A (H1N1) in Mexico." N Engl J Med 361 Aug. 13, 2009: 680. United States. Centers for Disease Control and Prevention. "Estimating Seasonal Influenza-Associated Deaths in the U.S." Dec. 9, 2016. <https://www.cdc.gov/flu/about/disease/us_flu-related_deaths.htm>. United States. Centers for Disease Control and Prevention. "FluView Interactive." Apr. 21, 2017. <https://www.cdc.gov/flu/weekly/fluviewinteractive.htm>. United States. Centers for Disease Control and Prevention. "Influenza (Flu)." Nov. 10, 2016. <https://www.cdc.gov/flu/>. United States. Centers for Disease Control and Prevention. "Seasonal Influenza (Flu): Influenza Antiviral Medications: Summary for Clinicians." Sept. 4, 2014. <http://www.cdc.gov/flu/professionals/antivirals/summary-clinicians.htm>. United States. Centers for Disease Control and Prevention. "Seasonal Influenza (Flu): Use of Antivirals." Sept. 1, 2011. <http://www.cdc.gov/flu/professionals/antivirals/antiviral-use-influenza.htm>. United States. Centers for Disease Control and Prevention. "2011-2012 Trivalent Influenza Vaccine Data From the U.S. Vaccine Adverse Event Reporting System (VAERS)." <http://vaers.hhs.gov/resources/SeasonalFluSummary_2011-2012.pdf>. United States. Centers for Disease Control and Prevention. "2009 H1N1 Flu (Swine Flu)." Oct. 12, 2009. <http://www.cdc.gov/H1N1FLU/>. United States. Flu.gov. "H5N1 Avian Flu (H5N1 Bird Flu)." <http://www.flu.gov/about_the_flu/h5n1/>.